Kabie Brook is chairperson and one of the co-founders of ARGH – Autism Rights Group Highland. We asked Kabie to tell us more about herself and her work. I live in Inverness and am the mother of four children. As well as having an Autistic family and being Autistic myself, I also have a long history of working with, for and alongside Autistic people; 25 years paid and unpaid with all kinds of people of all ages. For the last few years it is ARGH that has taken up most of my time. ARGH is an Autistic people’s organisation, run by and for Autistic people. I, along with the other founders, were passionate about Autistic rights and the lack of representation there was from our community in the conversation about autism; up until that point the dominant voice had been non-autistic people, talking about us rather than with us. Our aim is for Autistic people to be at the core of all things about us, on equal terms, from personal life to policy at government level. We don’t believe that this kind of inclusion should be only for a particular type of Autistic person either; everyone has something to offer, that is why ARGH promote self-advocacy for all Autistic people, recognising that this is not limited to a certain type of person: everyone self-advocates but many are ignored. We also educate professionals, parents and the general public about autism from an Autistic perspective; our next event in May 2014 is run in partnership with the National Autistic Society Scotland; a conference on ‘Autism and Ethics’ from an Autistic perspective. Our events have always been open to the whole community. We believe that building links between the Autistic communities, autism communities and the wider population is not only beneficial but essential; to have a fully inclusive society and to improve equality for all we need to foster links and have conversations that include everyone. Some of our past events are still available to listen to on our website. Partnership working is important to us; by partnering with other organisations we can make links that amplify the Autism Rights message to more and more people. Locally we are engaged in working with other agencies including the Highland Autism Improvement group and Police Scotland. Nationally ARGH works in partnership with the Scottish Government by being members of the Autism Reference Group; this is the group responsible for the implementation of the autism strategy. We also have strong links nationally and internationally with the autistic community and wider autism communities. Our successes have included changes in diagnostic procedure, including self-referral being made available and successful lobbying of the Minister for Public Health to ensure there is a One Stop Shop Service based in Highland, aiming to be Highland wide and available to all Autistic people regardless of their perceived IQ. Another of our projects has been to create an autism alert card, to be used as a visual aid: a card by us and for us, the ARGH card is available to all Autistic people, children or adults, across the UK and is already carried by hundreds of people. 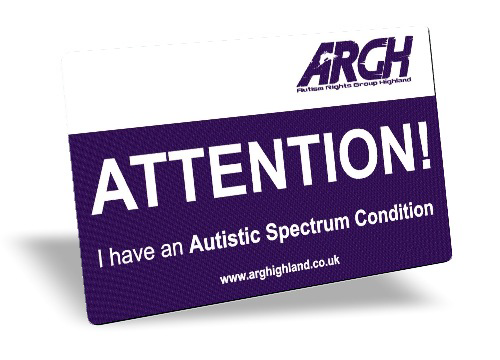 The Autism Alert Card is available via the ARGH website. We also host Autistic Voice, an online email group that aims to act as a network for autistic people and groups who want to make a difference and engage in autistic rights work locally or nationally. We are always looking for more members as we want to ensure as many people as possible are heard in everything we do. Working as a collective has the benefit of giving Autistic people a stronger voice: a number of people with the same issue are harder to ignore than an individual. Currently our meetings are held once a month in Inverness, you do not have to attend meetings to be a member; how much or little you chose to be involved is up to you.